A University of Vermont-led study of 300,000 children in 35 nations says kids whose watersheds have greater tree cover are less likely to experience diarrheal disease, the second leading cause of death for children under the age of five. 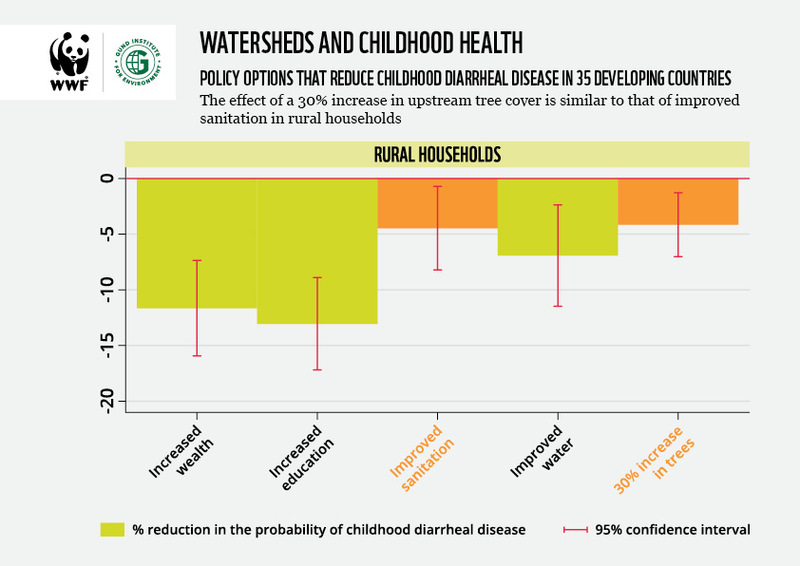 Published in Nature Communications, the study is the first to quantify the connection between watershed quality and individual health outcomes of children at the global scale. “Looking at all of these diverse households in all these different countries, we find the healthier your watershed upstream, the less likely your kids are to get this potentially fatal disease,” says Taylor Ricketts of UVM’s Gund Institute for Environment. Surprisingly, the team predicts that a 30 per cent increase in upstream tree cover in rural watersheds would have a comparable effect to improved water sanitation, such as the addition of indoor plumbing or toilets. The research is the first to use a massive new database that will enable “big data” approaches to study links between human health and the environment, globally. 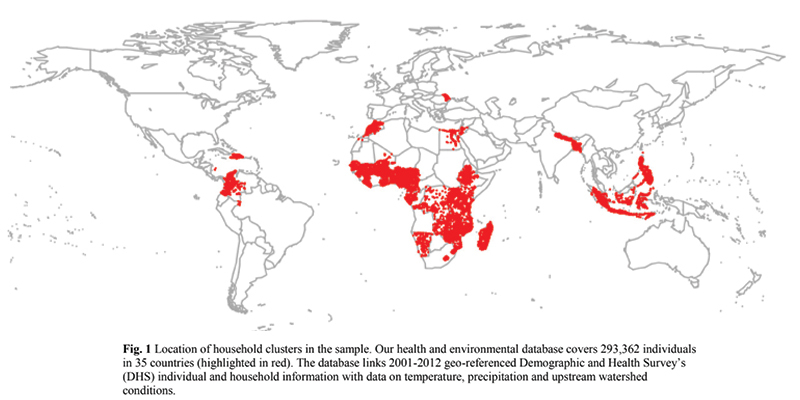 The database features 30 years of USAID demographic and health surveys, with 150 variables for 500,000 households, including spatial data on the environment. The researchers hope the findings help governments and development agencies to improve the health and environment of children around the world. They add that more research is needed to more fully understand exactly how watershed forests impact the risk of diseases like diarrhea, which has many causes, including waterborne pathogens. The research covers 35 nations across Africa, Southeast Asia, South America and the Caribbean, including Bangladesh, Indonesia, Philippines, Nigeria, Colombia, and the Democratic Republic of the Congo. The study was supported by the National Socio-Environmental Synthesis Center (SESYNC), Luc Hoffmann Institute and WWF, along with The Gordon and Betty Moore Foundation and The Rockefeller Foundation as part of the Health & Ecosystems: Analysis of Linkages(HEAL) program (now Planetary Health Alliance). The interdisciplinary research team was led by Brendan Fisher and Taylor Ricketts of the University of Vermont (who also led the database’s creation) and includes lead author Diego Herrera (Environmental Defense Fund/UVM), Alicia Ellis (UVM), Christopher Golden (Harvard University), Timothy Treuer (Princeton University), Alexander Pfaff (Duke University), Kiersten Johnson (USAID), and Mark Mulligan (King’s College London). 1 in 4 deaths of children under 5 years of age are attributable to unhealthy environments. 361,000 children die of diarrheal disease every year because of poor access to clean water, sanitation and hygiene. “The novelty is that this is a global study of individual people linking ecosystems and health around the world,” says Diego Herrera, a former postdoctoral researcher at UVM’s Gund Institute for Environment and Rubenstein School of Environment and Natural Resources, who is now at Environmental Defense Fund. Researcher Diego Herrera used big data to understand the global relationship between wetlands and childhood health.